Robert Simmons’ concise, illustrated encyclopdia of the 352 most important crystals, minerals and gemstones for self-healing and spiritual growth is the new standard for metaphysical work with stones. Every entry provides key words about each stone’s spiritual properties, scientific data, chakra and elemental correspondences, and the physical, emotional and spiritual qualities of the stone. The author’s essays offer added insights about how to work with the stones and which stones to combine with one another for optimal results. All this, plus vivid color photos, are presented an an easy-to-carry, easy-to-read pocket-size edition that you can take anywhere––to the crystal store or to the great outdoors! 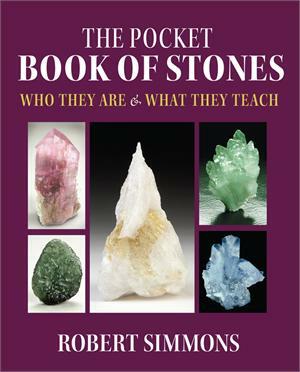 The Pocket Book of Stones contains information on twenty-five new stones not discussed in the original Book of Stones. Many of the author’s essays have been revised to include new insights discovered in his most recent work. This book makes an excellent gift both for beginners and experienced crystal-workers alike!